Second sinks in kitchens are not new. Even giving a secondary sink a very narrow job description has become more and more common... Remember when we called them "salad sinks"? Did anyone actually use one for salad? 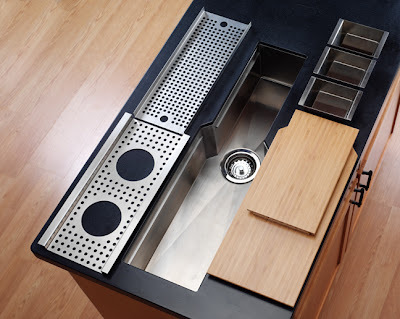 Many times, even in large kitchens, a poorly located secondary sink often ate up valuable work space that otherwise could have left a large uninterrupted multi-use part of a kitchen. Fortunately, many of the sink manufacturers are now offering something other than a standard salad sink(that's usually too big) or a bar sink(that's often too small). 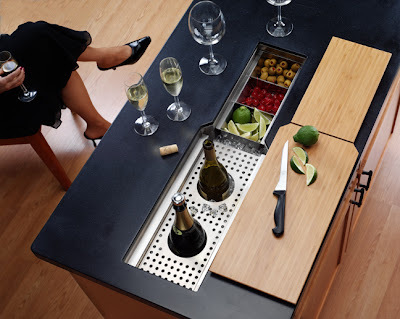 Notice that the narrow design allows for installation in just about any size island(or along a standard depth run of kitchen/bar/entertainment cabinets). The undermount installation along with drop in cutting boards covers the sink completely... And presto! Work space maintained! Unique inserts for chilling beverages, draining glasses, holding garnish and condiments make the space almost universally workable. After your big party, clean up will be a breeze. 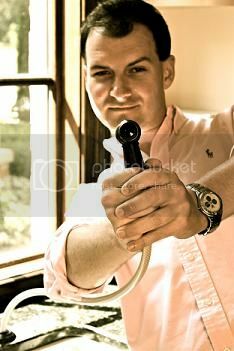 Did you notice in the pictures that there was no faucet? Pretty interesting concept, eh? Exactly how much would you need the sink for water, but using it with ice and beverages the main requirement is a drain. 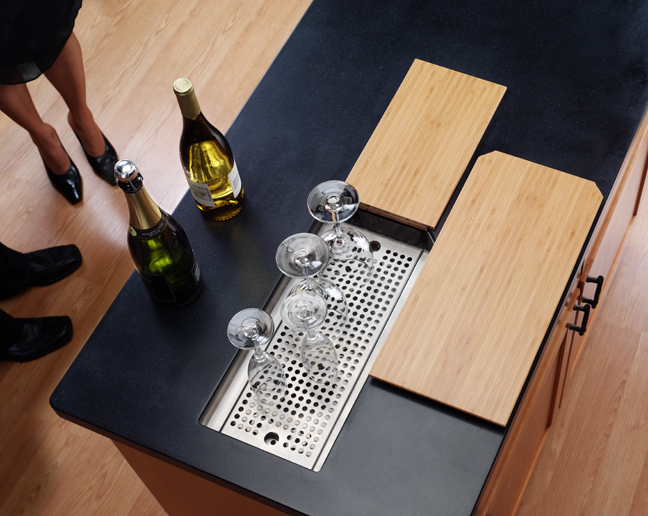 The Entertainer has a seamless drain that allows for super easy clean up and virtually no maintenance. I need one of these in my kitchen.